Do Fans Need Monitors? FRANCIS T. LANEY One of fandom's prime needs at the moment is some sort of program which will seize the neophyte and guide his faltering footsteps along the proper channels without at the same time forcing the older fans to devote much of their time to this end. As things now stand, little is done to orient the newcomer. He receives some of the fanzines--seldom enough to give him a good cross-section of the field --and very likely gets a welcom letter of booklet from the NFFF.If he happens to live near one of the few active local clubs, he may perhaps affiliate with it. But as a general rule, he is largely dependent on letters for becoming acquainted with fandom,and thereby developing into an active member of the microcosm. Right there is where he hits a snag. Few of the better-established fans have time to take on any appreciable amount of added corresondence.And those of the oldsters who do attempt to correspond with each new-comer usually throw off their poorer and more hurried letters to the neophytes, saving their better efforts for their close friends or for their fan-writing and -publishing. And very often, the enthusiasm of the beginner causes him to submerge with mail any established fan who rashly answers his letter, a procedure which usually makes the old-timer drop his new correspondent like a hot potato. Newer fans, who are not themselves far from the neophyte class, have more time and fewer commitments; can thus take on more correspondence, but on the other hand are usually less well fitted to carry it on. Generally speaking, all this results in one of two things happening. Either the neophyte quickly leaves the field, often before becoming really acquainted with it, his enthusiasm prematurely quenched by the apathy of those he has tried to contact-- or else he gets side-tracked into some clique of other novices, a little sub-fandom of his own. This is particularly likely to happen to the less mature neophyte; the older or more precocious novice can usually offer a good enough letter to seize the interest of any fan. 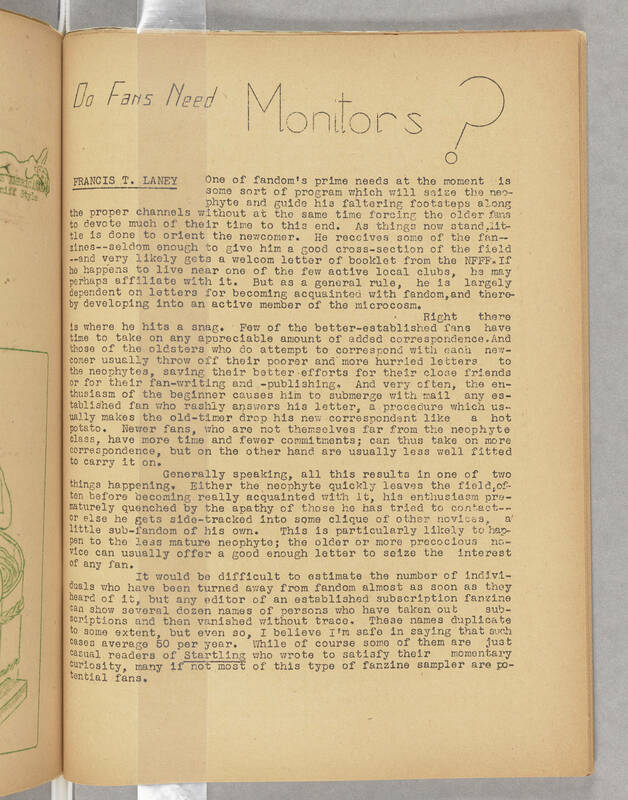 It would be difficult to estimate the number of individuals who have been turned away from fandom almost as soon as they heard of it, but any editor of an established subscription fanzine can show several dozen names of persons who have taken out subscriptions and then vanished without trace. These names duplicate to some extent, but even so, I believe I'm safe in saying that such cases average 50 per year. While of course some of them are just casual readers of Starling who wrote to satisfy their momentary curiosity, many if not most of this type of fanzine sampler are potential fans.